IAMGOLD Corporation announced in a news release that they have discovered a new gold-bearing zone at the Côté Gold Joint Venture Project, located 125 km southwest of Timmins and 175 km north of Sudbury, Ontario, Canada. The Côté Gold Project is a 70:30 joint venture between IAMGOLD Corporation and Sumitomo Metal Mining Co. Ltd (SMM Gold Côté Inc.). IAMGOLD reported on assay results from fourteen diamond drill holes (including the deepening of a historical drill hole) totaling 7,452 metres completed as part of its 2017 - 2018 exploration drilling program, which has led to the discovery of intrusive-hosted mineralization referred to as the Gosselin Zone. The Gosselin discovery represents the most significant drill intercepts of continuous gold mineralization so far encountered outside of the Côté Deposit on the joint venture project mineral holdings. "The Gosselin Zone is a new grass-roots discovery, the result of our ongoing commitment to sustained exploration and an excellent group effort by the Côté Exploration team, " stated Craig MacDougall, Senior Vice President, Exploration for IAMGOLD." "With the completion of a positive feasibility study for the Côté Gold deposit in 2018, demonstrating a solid development opportunity with a long mine life and low production costs, this exploration success continues to add to our track record of resource expansion and further enhances the long term value of this exciting development project," MacDougall added. The Company also reported assay results from a drill core re-logging and sampling program of historical drill holes located along a potential south-west extension of this discovery, referred to as the Young-Shannon Zone. The "Gosselin Zone" is located approximately 1.5 km northeast of the Côté Gold Deposit. The Côté Deposit (on a 100% basis) hosts estimated Proven and Probable Mineral Reserves totaling 7.3 million ounces of contained gold and Measured and Indicated Mineral Resources (inclusive of Reserves) totaling 10.0 million ounces of contained gold, and Inferred Mineral Resources totaling 2.4 million ounces of contained gold (see news releases dated November 1, 2018 and February 19, 2019). 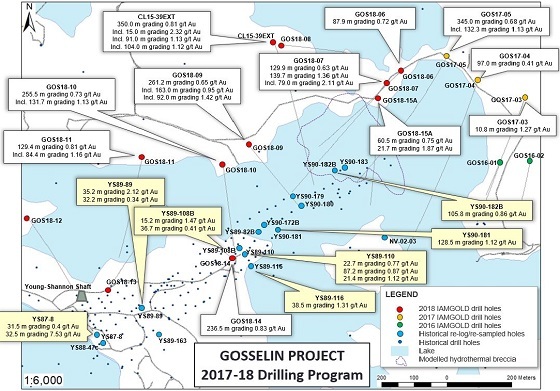 The 2017 - 2018 exploration drilling program was designed to test the continuity of the new Gosselin zone in a number of directions from the discovery hole (GOS17-05) and to determine if the gold mineralization intersected at depth extends to surface. The program included one drill hole executed as a deepening of a pre-existing shallow drill hole from 2015 (CL15-39 EXT). All drill holes from the 2017 - 2018 campaign were collared from land on the north shore of Three Ducks Lake. The drilling program has confirmed the presence of a wide corridor of gold mineralization with approximate dimensions of 750 metres (strike), 200 metres (width) and 400 metres (depth). Thirteen of the fourteen completed drill holes intersected significant core intervals with elevated gold values. After the initial discovery of the Gosselin Zone, a re-logging and core sampling program of historical drill holes which originally targeted the near-by Young-Shannon high grade vein system to the southwest of the Gosselin Zone was initiated to seek a possible connection to the intrusion hosted mineralization intersected at Gosselin. Historical exploration work carried out on the Young-Shannon property since the late 1920's and intermittently until the early 2000's, included extensive diamond drilling (225 drill holes and > 33,300 metres of drilling) and underground exploration comprising a shallow inclined shaft with levels at 30 and 57 metres depth, along with a limited amount (200 metres) of lateral development. The historical work outlined gold values over narrow widths in structurally-controlled quartz-veins within the more mafic phases of granodiorite, and it was concluded by previous owners to be an Archean lode-gold style of mineralization hosted in discontinuous veins. The 2019 Phase I exploration diamond drilling program has commenced and entails the completion of 15 planned diamond drill holes (4,500 metres) mainly on Three Ducks Lake. The program is designed to test for the extension of the new Gosselin zone to surface beneath Three Ducks Lake, and to delineate the ultimate size potential of this discovery. The program will also test for continuity between the new Gosselin Zone and the recently discovered intrusion-hosted gold mineralization associated with the Young-Shannon Zone. As results merit, a second phase of drilling is anticipated to complete an infill drilling program (50 to 75 metres drill hole spacing) to support the completion of an initial NI 43-101 compliant resource estimate in 2020. IAMGOLD announced on January 28, 2019 that it was shelving its Côté Lake project until conditions in the gold market improved.